If you want to become a dental hygienist, come and attend our Vocational Education and Training in Oral Hygiene for two academic years. 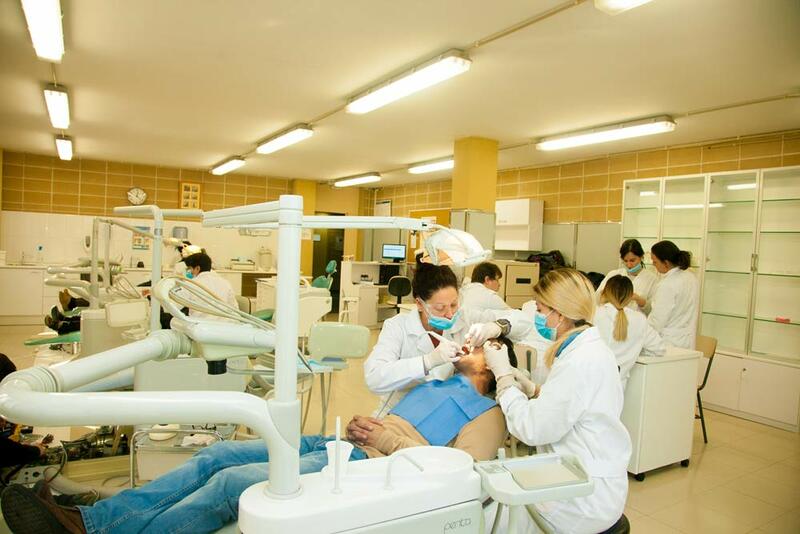 You will practise with real patients in our clinical classroom equipped with 5 dental chairs. Our students, future primary healthcare professionals, are able to provide full oral health care, place pit (small hollows) and fissures (grooves) sealants, apply fluoride varnishes and administer fluoride treatments and, moreover, they often carry out tooth whitening. Furthermore, they perform examinations and provide specific oral hygiene instruction to our primary school children. 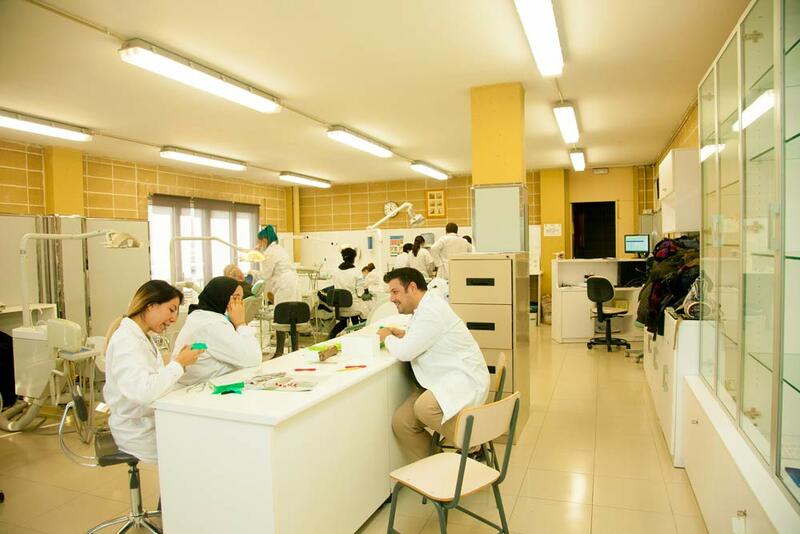 Since 2014, the School has collaborated with the Catalan Health Institute ( ICS ) for care for oral health treatments for patients who are in poverty, which are derived from school with the double objective of offering, on the one hand, the students of the oral hygiene training course the opportunity to practice with real patients, so that they could apply the theoretical knowledge acquired and, on the other, to realize an act of solidarity with people who, due to their economic situation, are at risk of social exclusion. All our teaching staff have a high degree of commitment to teaching. They are dentists and prosthetists who also work part of their work in dental clinics and laboratories. 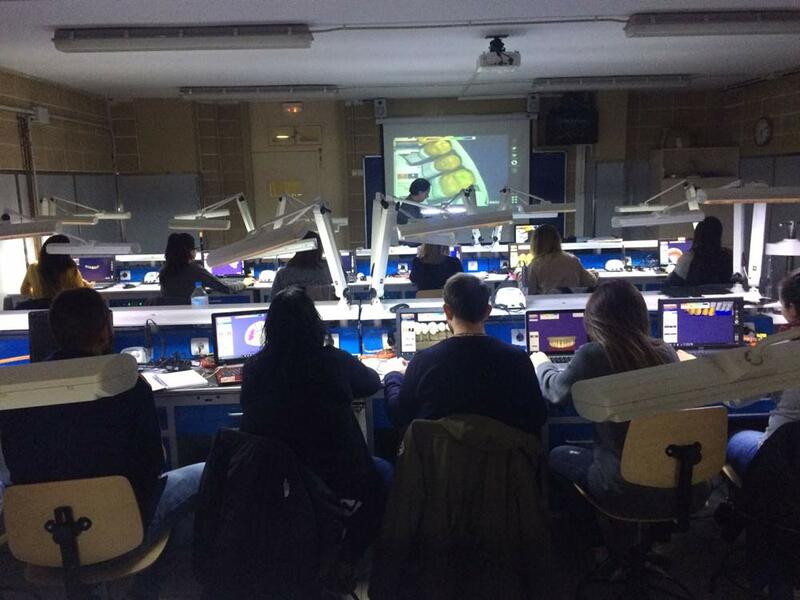 In our opinion, this is the best way to teach a profession and to be able to transmit to the students the changing needs of the dental sector. From school we promote learning based on the simulation of everyday situations in the workplace. Applying the neurodidactic, we achieve the significant learning of contents linking the theoretical and the practice of pleasant form. 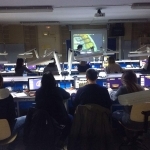 The 2015-2016 course began with an agreement with the International University of Catalonia (UIC), in which the students of the second year of the Dental Prosthesis training cycle perform the prostheses that will be placed on the floor for fourth and fifth year students of the Faculty of Dentistry to attend to patients at risk of social exclusion that they receive through the Red Cross. 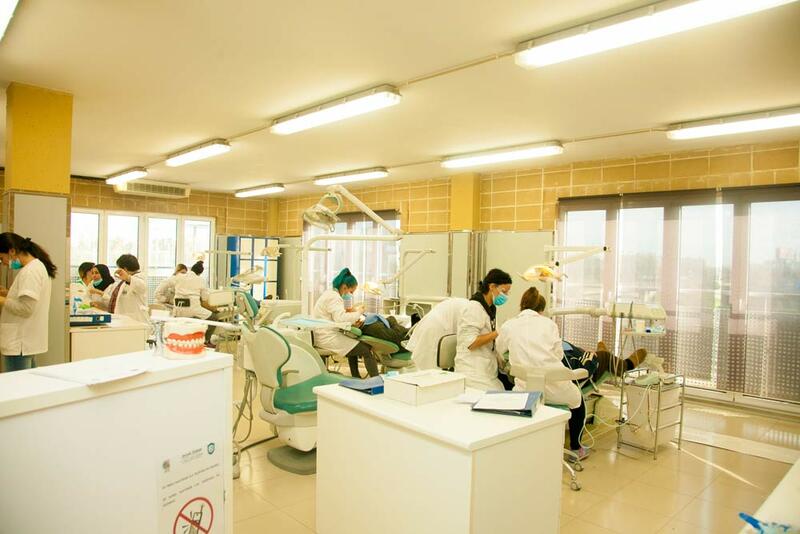 Recently, the facilities of the Dental Prosthetics and Oral Hygiene Practices classrooms have been remodeled in order to offer our students the most real working environment. Our “All-Inclusive” system makes the student have everything necessary to study without extraordinary expenses: Instrumental and hygiene material and dental prosthesis, one, access to our virtual campus, contents … This allows you to study without any hassles or surprises. • The digitized didactic contents of the cycle, necessary for monitoring the theoretical classes, practices and seminars. These contents can be downloaded to be worked by the student. • News and events of our day to day. The students will be able to complement their training with preparatory classes for the PAU with a schedule adapted to their needs. This training is taught by high school teachers from our center, with extensive experience in the preparation of these tests. 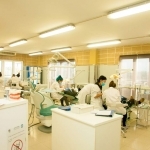 We have collaboration agreements with dental clinics and laboratories throughout Catalonia. Wherever you come from, we will find a company where you can make your practices conveniently. We also have companies to do your training in the dual mode. 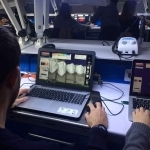 Thanks to the relationship between our teaching staff and the dental sector and the years we have been sending students to practice in companies, we have a very active job market in which many clinics and laboratories have been trusting for years. This service is available throughout the professional life of our students. • In person: Monday to Friday in the morning shift. • Open classroom: If you can attend class regularly but your day to day has changing schedules, this is your mode. • Online: regularly attend the school to perform exams, practices and seminars. It is the easiest way to study comfortably combining work and studies. • Also, in case of not exceeding the contents in the first call, recovery exams are made throughout the course. • We value at all times what the student is learning. This allows us to modulate the learning process to ensure that everyone reaches content in an appropriate manner. Once the oral hygiene training is finished in our school, the student will have made a total of 2,000 hours of training spread over 1584 hours in the center and 416 hours of practice in a dental clinic. The purpose of the practices in the dental clinic is to enhance the skills acquired by the student during the Training Cycle. The total duration of the training cycle is divided into two academic courses. The hours taught in the center are theoretical and practical, carried out daily in small groups. The practical training is taught from the first week of the course with real patients. The evaluation and monitoring of the student is continued. Both theoretically and practically, students will have a personalized follow-up throughout the course. Students will enjoy talks from professionals in the sector, in order to keep abreast of the latest developments, and will have the opportunity to attend conferences and courses both in our country and Europe * students can participate in school projects and of the neighborhood. (The outputs are not included in the price of the cycle). Once the oral education hygiene cycle has been passed, students are trained to perform explorations, detect and record the oral health of the people. On the other hand, the students will be able to prevent the oral diseases, by means of direct intervention know the established norms of hygiene and quality. 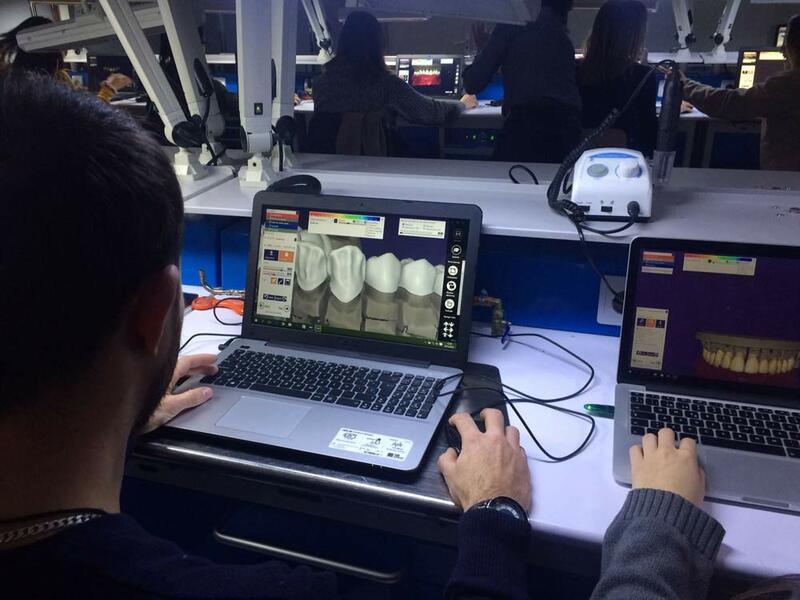 · Manage the files of patients in a dental cabinet. · Prevent risks and optimize resources, collaborating with the programming of activities of the oral health unit. · Design health education activities to promote oral health. · Psychological support to patients / users. · Apply support and support techniques in dental treatments. • Specialist in oral hygiene. Once the dental prostheses training is completed in our school, the student will have completed a total of 2,000 hours of training distributed in 1584 hours in the center and 416 hours of practice in a dental laboratory. The purpose of the practices in the dental laboratory is to enhance the skills acquired by the student during the Formative Cycle. The total duration of the training cycle is divided into two academic courses. The hours spent at the center are theoretical-practical, carried out daily in small groups. Practical training is taught from the first week of the course with real clinical cases. The evaluation and follow-up of the student is continuous. Both theoretical and practical, students will have personalized follow-up throughout the course. Students will enjoy talks from professionals in the sector, in order to be up to date with the latest news, and will have the opportunity to attend conferences and courses both in our country and in Europe * students will be able to participate in projects of the school and the neighborhood. *(Exits are not included in the price of the cycle). – manage a dental prosthesis laboratory, performing operations for the commercialization of products according to current regulations for safety and environmental protection and quality specifications. – Design, prepare, elaborate, manufacture and repair complete removable resin prosthesis. – design, prepare, manufacture, manufacture and repair orthodontic appliances and occlusion splints. 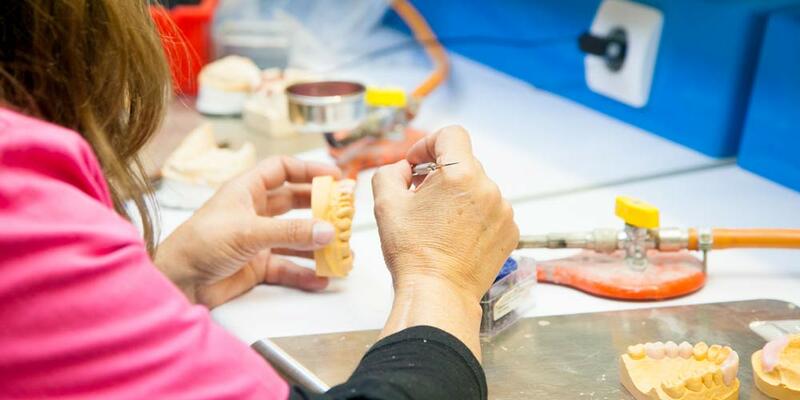 – design, prepare, elaborate, manufacture and repair restorations and metal structures for the manufacture of fixed metal-ceramic and / or metal-resin dental prostheses. – design, prepare, prepare, manufacture and repair partial removable metal, resin and mixed prostheses. – design, prepare, elaborate, manufacture and repair aesthetic coatings and ceramic or resin restorations, with or without metal. Once the dental prosthesis studies have been completed, this professional will carry out the activity in the health sector, in private companies or in healthcare institutions, as a manufacturer of custom dental sanitary products in dental prosthetic laboratories, as a self-employed worker or on account of others, and in companies of the dental industry, such as factories suppliers of materials and machinery, or in dental deposits, participating in the specific training activities of the company. You can also develop your activity in the field of technological research within companies in the sector. – Higher technician in dental prosthesis. – Technical manager of a dental prosthesis laboratory. – Commercial in the dental industry or dental deposits. – Technical manager in departments of research and development of products in the dental industry. What is the FP Dual? 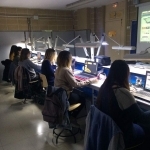 · Adaptation of students to the company model. · Contribution in the reduction of the youth unemployment rate. · High probability of attracting talent. · The company manages the registration in the S.S. as a scholarship holder (scholarship quote account) and realize the financial compensation to students. · Remuneration to agree between the company and the School. Minimum reference: IPREM proportional to actual hours of work. (€ 532 / month). · Intensive stay for 10 months at the company during the second year. · Agreement between the company and the Educational Center of the contents in which the achievement of the curricular objectives is guaranteed. · Mechanisms of follow-up. Weekly follow-up between the tutors for the coordination, monitoring and exchange of information. The selection of FP students is carried out entirely by the school and participating companies. To do this, there is the possibility that you quote for an interview, take into account the academic record, etc. In what period do I have to go to class and at what in school? 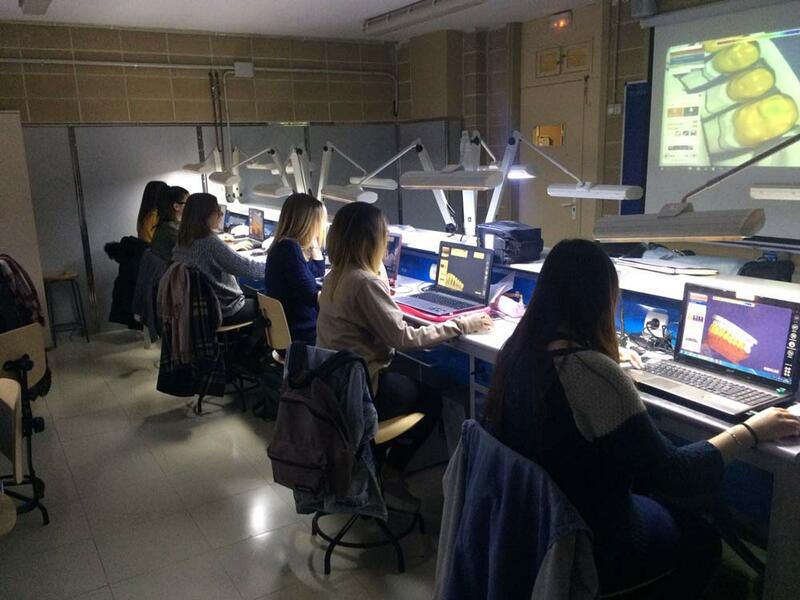 The Fp Dual is carried out in the second year, a period in which students combine hours at the center and at the company. Yes, it is mandatory, except for the hours stipulated for the stay in the company. In the event of class failures, it will be carried out according to current regulations. When do I receive the scholarship? During the period of stay in the company. Does the company sign up for social security? Yes. During his period of stay in it. Where do you collect all these terms? · The first is an agreement between the company, the educational center and the Ministry. · The second, an agreement with the student. In this agreement the previous considerations must appear. What lessons will I get from the company? The company has a reference training plan agreed with the center that is in the process of acquiring the professional competences of the student in the company’s own environment. Is the title obtained through the DUAL modality the same as in the face-to-face mode? The training cycles of dental prostheses and oral hygiene have a very important practical load. For us it is essential to ensure that the student reaches the necessary knowledge and skills to access the labor market with the maximum guarantees of success regardless of the type of study he has chosen. That’s why our online courses allow you to reconcile your work and personal life with your training but have constant face-to-face content throughout the course. Also, another advantage is that the student, when attending the class with regular set-manal, has the peace of mind of having direct contact with both his classmates and his tutor (dental and dental prosthetics). • Do the practice in the center continuously: You can not learn the truth if you do not learn by doing what you have taught yourself. • Receive help from your tutor to prepare the theoretical exams. • Carry out the theoretical examinations sequentially. · CFGS of dental prosthesis: Tuesday and Thursday from 3 a.m. to 8 p.m. during two academic years. • Group morning: Monday from 8 a.m. to 1 p.m. during 2 academic years. • Group afternoon: Friday from 15 a.m. to 8 p.m. during two academic years. If these hours are not compatible with your work, please contact us to study your case. What will i have at home if i am an online student? • The theoretical contents of all the training units. • Videos and explanatory links to the contents. • Direct access to peer and teacher email addresses. • News and events of your cycle.